Finely shred 1 salad onion and slice the rest; set aside. Take 6 prawns, remove the tails and chop the bodies. Mix the flours, baking powder, turmeric and sugar in a bowl and gradually stir in about 200ml cool water to make a thick batter. Add the sliced salad onion, chopped prawns, ginger and sweet potato; mix well. Heat the oil in a large frying pan on a medium heat. Using a soup spoon, scoop out some of the mixture and stick a whole prawn on top. Use another spoon to help slide this carefully into the oil, prawn-side up – this can be a bit fi ddly. Fry for 2 minutes on each side until lightly golden. Drain on kitchen paper. Repeat. 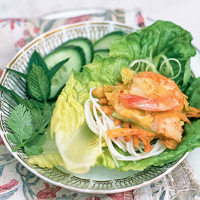 Put a few noodles, a hot fritter and a little shredded salad onion in a lettuce leaf, with some herb leaves and cucumber. Serve the dipping sauce on the side.